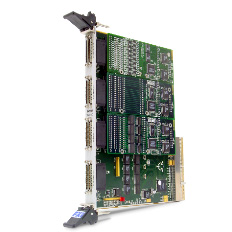 The GX5731 is a 6U modular digital I/O card with 224 I/O channels. Designed for ATE, data acquisition, or process control systems where a large number of discrete I/O channels are required, the GX5731 offers the highest density in the industry for a single PXI plug-in board. Of the 224 channels, 128 support TTL levels with the direction of each group of eight channels programmable as input or output. The other 96 channels can be used for customized I/O using MTS' GX57xx series I/O modules. The GX5731's 224 digital inputs or outputs are arranged as seven 32-bit ports. Four of the ports provide 128 TTL levels and can be programmed for input or output in groups of 8. The other three ports require GX57xx I/O modules that provide customized levels, handshaking, and on-board memory. The GX57xx modules expand the I/O capability of the GX5731's input or output channels. The GX5731 can accommodate up to three I/O modules to achieve custom I/O levels and functions. I/O modules provide between 16 and 32 channels. Some offer on-board memory for vector I/O sequencing. The GX5701 module provides 32 input channels with programmable threshold (-12 V to +12 V), handshaking for synchronization, and 4 K of vector memory. The GX5701 is compatible with the obsolete Summation DIL card. The GX5702 module provides 32 TTL output channels, handshaking for synchronization, and 4 K of vector memory. The GX5702 is compatible with the obsolete Summation DOL card. The GX5704 module provides 32 optically isolated open-collector outputs which are capable of driving signals up to 50 V with 500 mA of current sink capability. The module also supports handshaking for synchronization, and 4 K of vector memory. The GX5704 is compatible with the obsolete Summation DPO card. The GX5709 module provides 32 RS-422 differential I/O channels. Direction is programmable in groups of eight. The GX5711 module is a bi-directional I/O module and converts 16 differential LVDS inputs to TTL outputs or 16 TTL inputs to 16 differential LVDS outputs. The GX5712 is a bi-directional I/O module and converts 16 differential RS-422 inputs to TTL outputs or 16 TTL inputs to 16 differential RS-422 outputs. The board is supplied with the GXPIO library, a software package that includes a virtual instrument panel, and a Windows 32/64-bit DLL driver library and documentation. The virtual panel can be used to interactively program and control the instrument from a window that displays the instrument’s current settings and status. In addition, interface files are provided to support access to programming tools and languages such as ATEasy, LabView, LabView/Real-Time, C/C++, Microsoft Visual Basic®, Delphi, and Pascal. An On-Line help file and PDF User's Guide provides documentation that includes instructions for installing, using and programming the board. A separate software package - GtLinux - provides support for Linux 32/64 operating systems.